Dr Margaret Chan, WHO Director-General, Dr Zsuzsanna Jakab, WHO Regional Director for Europe, and Dr Nedret Emiroglu, Director of the Division of Health Emergencies and Communicable Diseases at WHO/Europe (centre) took part in the verification ceremony for the United Kingdom Emergency Medical Team on 26 May 2017. Decisions taken by delegates at the World Health Assembly focused on implementing the International Health Regulations (IHR) (2005) and improving the prevention, diagnosis and treatment of sepsis. Delegates emphasized the urgent need to achieve full implementation of the IHR. Public health prizes were also awarded. A number of Member States, including Germany, the Russian Federation and Switzerland, made interventions expressing their support for the “Evaluation and review of the global strategy and plan of action on public health, innovation and intellectual property” report. Member States also overwhelmingly supported the report of the Consultative Expert Working Group on Research and Development: Financing and Coordination. Committee A noted both reports. Several European Member States spoke during Saturday’s session on addressing access to medicines and vaccines. Kazakhstan welcomed the role of WHO in preventing the shortage of essential medicines in developing countries, and agreed with the report from the Secretariat. It also called for stronger action on vaccine hesitancy and the spread of misinformation regarding vaccination. The Russian Federation also supported the report, and described work at the national level to take uniform decisions on the prices of medicines. Both Austria and the United Kingdom expressed support for the recommendation to develop a notification system for medicines and vaccines at risk of shortage, but the United Kingdom asked for further information regarding the financing of such a mechanism. France and Norway called for more and faster progress on the mobility policy. Sweden and other countries underscored the need for increased efforts to achieve gender parity within WHO. Germany, Spain and the United Kingdom also recognized the progress made on human resources reform, but called for continued efforts in areas such as gender equality. The Director of Human Resources provided an update on the status of the mobility policy, reaffirmed WHO’s commitment to gender equality among its staff, and provided information about programmes that aim to make the management of WHO staff more consistent across the Organization. Several Member States also commented on the current age of retirement and whether to raise it. During a discussion on WHO’s presence and performance in countries, territories and areas, Malta, on behalf of the European Union, confirmed the importance of country-specific activities and called for clear criteria and strategies for both establishing and closing country offices. Malta also requested more details about staff planning on poliomyelitis. France further commented that a strengthened United Nations presence in countries will help them to achieve the Sustainable Development Goals. The Russian Federation requested further advancements in information dissemination and transparency on budgets. Norway noted the increased importance of country offices and the importance of identifying how to optimize them. Lithuania called for more rapid progress on reform. Ian Smith, Executive Director of the Director-General’s office, noted that the new Director-General will receive a detailed briefing on reform and what remains to be done. Member States also discussed WHO’s engagement with non-state actors. The United Kingdom Emergency Medical Team (UK-EMT) was successfully classified as Type 1 (outpatient emergency care) and Type 2 (inpatient surgical emergency care) during a ceremony on Friday. Dr Margaret Chan, WHO Director-General, Dr Zsuzsanna Jakab, WHO Regional Director for Europe, and Dr Nedret Emiroglu, Director of the Division of Health Emergencies and Communicable Diseases at WHO/Europe, took part in the verification ceremony. 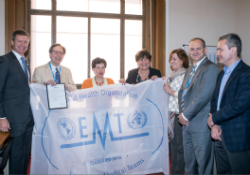 Ambassador Mark Matthews, Deputy Permanent Representative to the United Nations and other International Organizations in Geneva, accepted the classification on behalf of the UK-EMT. The UK-EMT is the first in the world to have a rehabilitation specialty team. It has been deployed in response to the Ebola outbreak in Sierra Leone, the Haiti earthquake, Typhoon Haiyan in the Philippines and the Nepal earthquake. It regularly sends experts and trainers to support capacity-building, mentorship and verification of other Member States’ emergency medical teams. Dr Zsuzsanna Jakab met with Professor Michel Kazatchkine, the United Nations Secretary-General’s Special Envoy for AIDS in Eastern Europe and Central Asia. They discussed intensifying support to eastern European and central Asian countries for the fight against HIV/AIDS, tuberculosis and multidrug-resistant tuberculosis.